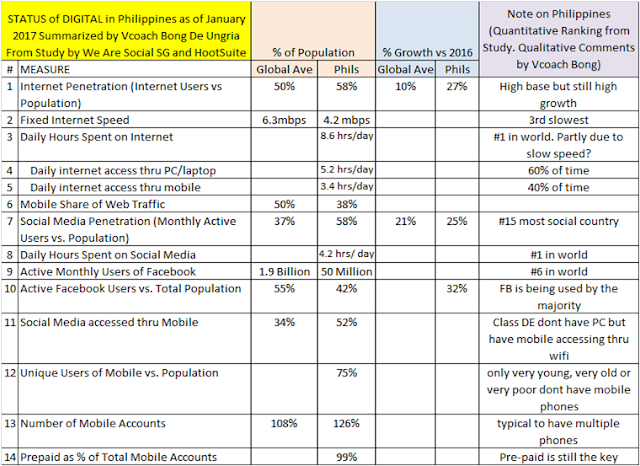 Where is the Philippines now in terms of Social Media and Digital? This is the video lecture I use in my Digital Marketing classes. The data is as of January 2017 and the reference files are indicated below. 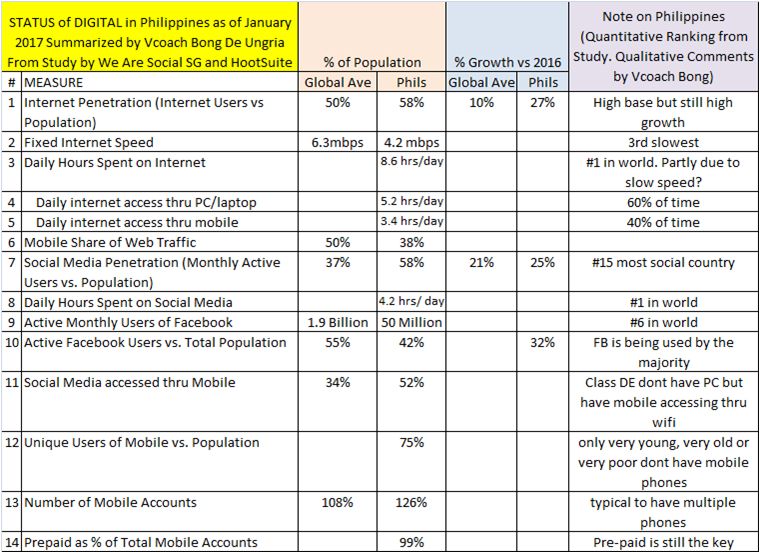 Below is a summary of the Philippine data which was the "extracted" report created annually by Third Team Digital Media and uploaded January 2017 from the data by We Are Social and Hootsuite. Pls. comment with at least 1 set of insight and action as a result of the above information... Pls. comment below. (Also, where applicable, pls. compose your answer first in your blog. Then copy the url of your blogpost as well as the content of the blogpost in the comment portion. Pls. see my sample comment at the bottom of this blogpost. Insight: Filipinos are a patient audience. They spend more time on the internet partly because of the slow internet speeds. Action: Content on my internet pages should put a higher priority on speed of loading on low end mobile phones with slow connections rather than dazzling but slow. Pls. comment below and on your blog! Insight: Philippines has the third lowest fixed internet connection speed at average of 4.2 mbps. Action: The internet provider in the Philippines should install the necessary infrastructure in order to improve the speed of the internet connection. Insight: Thanks. Very clear indication of opportunities among Filipinos in the Digital world. Despite handicapped on network landscape to get them connected in more than 7100+ islands in the country and challenges on technology speed and capabilities, the interests are massive and still growing tremendously. Action: Wake up call to action among network providers, could be in partnership to government and enthusiastic NGOs, to upbeat infrastructure to support growing needs in the Philippines and leverage on any similar analysis above to create value opportunities in the future. PH has done well in the BPO industry, here's another opportunity where Filipinos and skills are already actively online waiting to be tapped. Goodluck. Insights: Filipino’s way of life is changing. More & more are using the internet. Despite of slow internet speed, we spend more time online. Most of the usage is on social media and usage is still growing. The potential is very high to reach to every Filipino in using these medium. Action: Due to archipelagic condition of our country, infrastructure to improve the speed and most specially the “coverage” are the main concern for all Filipinos to be connected. The government, TelCos & NGOs must create ways to improve the condition. Make ways to maximize the phenomenon of reaching everyone even in the far flung areas. The use of internet connectivity is not limited only to social networking. We can utilize; e-commerce, e-banking, e-learning, introduction to IoT and others. Insights: With the amount of time Filipinos spend online, whether connected for work or connecting with virtual word indicates that we were already digitalized. The amount of time we are spending in front of our devices indicates that there’s an huge opportunity of information to be shared –at least on valuable information. On common cases, there is wastage and opportunity loss on this and attributed to two main things, non-valuable information and low internet velocity. Not to mention the stress and frustrations that comes with the later. Action: Corruption will maintain our current ranking in the race for internet speed. There should be lessons learned from the SMC-Telstra failed partnership. Minimum telco & internet service provider fixed internet speed should be enacted into a law. Tangible and intangible benefits will be realized, that includes decline of cases of hypertension. Insight: We spend a third of our lives online and regardless of generation, there are too many of us who could use some lessons on internet do's and don'ts. The consequences range from the comical (the indelible image of an elderly relative showing a little too much skin) to the deadly serious (a child falling victim to an online predator). Action: Online safety,security,ethics, and etiquette should be made part of school curriculum. Also a business opportunity: offer services to clean up online footprints and manage internet personas. Insights: For the past decade, we have grown remarkably digitally. It has help people get connected in just a click, created a lot of business and opportunities, improve the way we live, makes life easier.The internet has removed walls and boundaries, education has become more accesible to everyone regardless of physical location. We can do more if the telecom infrastractures are better. Actions: There is a need to break the long been monopoly in Telecom industry. To enforce improvement, we need to open up the doors of competition thru the coming in of new Telecom provider from different countries. This will also benefit the country thru the transfer of technology. Insight: Filipinos are motivated to be accepted within a group or a community. Filipinos want to be always in the “know” and care about what others think of themselves. Thus, it is not surprising to know that we are no.1 in the world for having the highest hours of time spent in social media and no. 6 as the world’s most active Facebook users. With this information, small businesses and entrepreneurs, like me, may see Facebook as one of its marketing platform to increase brand awareness and to capture its target market easily. However, looking closely, many businesses believed that Facebook Ad is a bad investment because their Facebook Ad Pages do not usually translate into sales. Action: Filipinos value strong ties with family and friends. Facebook connection has highlighted this trait among us. Understanding this connection can direct any business to create a community that nurtures and supports the members’ interests and NOT just making them feel that they are just being targeted for promotion. There is no exact recipe for instant success in social media marketing but one thing is sure, the Philippine market is ready for anything that digital marketing has to offer and is just waiting to be tapped. These are the great blogs; I assure you that I really enjoyed a lot in reading.